Scanning sonar from a scientific expedition has revealed the remains of a previously unknown shipwreck more than a mile deep off the North Carolina coast. Artifacts on the wreck indicate it might date to the American Revolution. 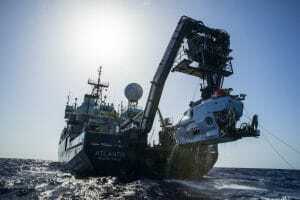 Marine scientists from North Carolina State University, Duke University and the University of Oregon discovered the wreck on July 12 during a research expedition aboard the Woods Hole Oceanographic Institution (WHOI) research ship Atlantis. They spotted the wreck while using WHOI’s robotic autonomous underwater vehicle (AUV) Sentry and the manned submersible Alvin. The team had been searching for a mooring that was deployed on a previous research trip in the area in 2012. The research vessel Atlantis with the submersible Alvin hanging off its stern. Photo credit: Luis Lamar, Woods Hood Oceanographic Institution. Among the artifacts discovered amid the shipwreck’s broken remains are an iron chain, a pile of wooden ship timbers, red bricks (possibly from the ship cook’s hearth), glass bottles, an unglazed pottery jug, a metal compass, and another navigational instrument that might be an octant or sextant. The wreck appears to date back to the late 18th or early 19th century, a time when a young United States was expanding its trade with the rest of the world by sea. 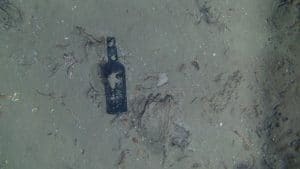 “This is an exciting find, and a vivid reminder that even with major advances in our ability to access and explore the ocean, the deep sea holds its secrets close,” said expedition leader Cindy Van Dover, director of the Duke University Marine Laboratory. “This discovery underscores that new technologies we’re developing to explore the deep-sea floor yield not only vital information about the oceans, but also about our history,” said David Eggleston, director of the Center for Marine Sciences and Technology (CMAST) at NC State and one of the principal investigators of the science project. After discovering the shipwreck, Van Dover and Eggleston alerted NOAA’s Marine Heritage Program of their find. The NOAA program will now attempt to date and identify the lost ship. Bruce Terrell, chief archaeologist at the Marine Heritage Program, says it should be possible to determine a date and country of origin for the wrecked ship by examining the ceramics, bottles and other artifacts. One of nine glass bottles observed at the site of a centuries-old shipwreck off the North Carolina coast. Photo credit: Woods Hood Oceanographic Institution. James Delgado, director of the Marine Heritage Program, notes that the wreck rests along the path of the Gulf Stream, which mariners have used for centuries as a maritime highway to North American ports, the Caribbean, the Gulf of Mexico and South America. Bob Waters of WHOI piloted Alvin to the site of the newly discovered shipwreck after Sentry’s sonar-scanning system detected a dark line and a diffuse, dark area which they thought could be the missing scientific mooring. Bernie Ball of Duke and Austin Todd of NC State were aboard Alvin as science observers. The expedition has been focused on exploring the ecology of deep-sea methane seeps along the East Coast. Van Dover is a specialist in the ecology of deep-sea ecosystems that are powered by chemistry rather than sunlight, and Eggleston studies the ecology of organisms that live on the seafloor. Funding for the research expedition and for the development of Sentry came from National Science Foundation grants #OCE-1036843, #OCE-1030453 and #OCE-1031050. NOAA’s Marine Heritage Program is part of its Office of National Marine Sanctuaries.